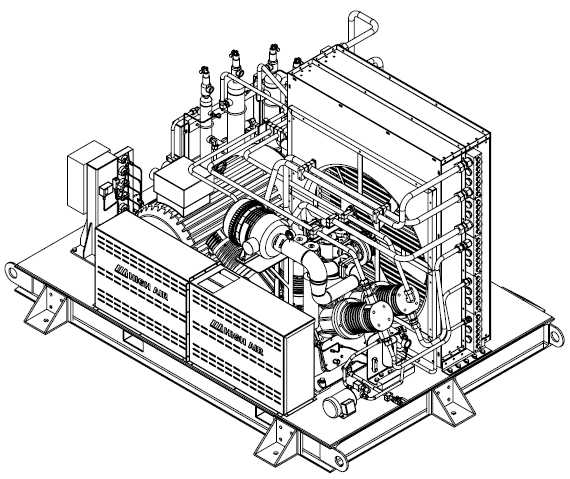 The cooling system on the compressor consists of air cooling. in the range of 0°C / + 45°C max. The unit is complete assembled on one base frame and will be tested under full load before shipment.and the HIGH AIR-QA-System which has been certified corresponding to ISO 9001. (downstream aftercooler)	-	approx. +15 °C above cooling air temp. Safety valves	spring loaded, after each stage. Pressure gauge	after each stage. Including complete mounting, tubing, cabling, painting and testing of the unit in our workshop. For monitoring and control of all compressor functions. Designed with steel-sheet enclosure; protection IP54; control voltage 24 V DC; with built in power- and PLC element; wall fastening and timing relay for alternate condensate drain .